Our product range includes a wide range of ptfe lined cross. We have gained immense recognition by offering a quality assured range of PTFE Lined Cross. 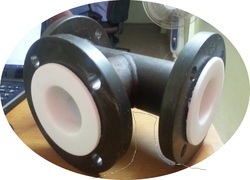 We use the best grade material to manufacture the lined cross fittings. Our quality experts perform a test on this lined cross fitting to make assure about its quality. Our customers can take this the lined cross fitting in several specifications to meet the diverse needs of our customers.